Cyprus is a small and expensive island-nation, and was our re-introduction to the 1st world after 6 months of cruising. We visited Cyprus in June 2003 while helping a friend deliver his motor-trawler from Egypt to Turkey. Cyprus is a small island-nation, settled around 1000 BC with a long history of being dominated by outside nations from the Assyrians in 700 BC to Britain in the 20th century. Presently part of it is independent and the other part is a source of contention between Greece and Turkey. The price of goods shocked us since their currency (Cypriot pound) was worth $US2, and goods cost twice what they would in the US. This small town was a haven for yachts with warm waters, good infrastructure, and a location outside of the European Union (EU) so that owners could avoid the 18% VAT payable on yachts coming into the EU. Their accession to the EU in May 2004 removes that advantage, and the high cost of living will undoubtedly make some of the yachts move elsewhere. Larnaca has lots of good sea-side restaurants, excellent provisioning, and all 1st world services. We were introduced to Marks and Spencer, one of the UK's premier department stores which helped blow our budget for the month. The marina is mixed news: the inner harbor is quite secure, however we were forced to tie up in the outer harbor against a concrete bulkhead. A fresh southerly brought a chop into the harbor that made boarding boats dangerous - in one case causing Judi to fall between the surging boat and the bulkhead, a very dangerous position. We rented a car and drove to Limassol to visit friends on Pegasus. The hills were dry and rocky with evidence of defenses along the coast left by Britain when the controlled the island in the early 20th century. The roads were very good and the sea views were stunning as we approached Limassol and the other major port for cruisers. Republic of Cyprus - The southern part is an independent and prosperous country catering mostly to British tourists and one of the recent (2004) members of the European Union. It has close ethnic to Greece plus political and financial ties to Great Britain. 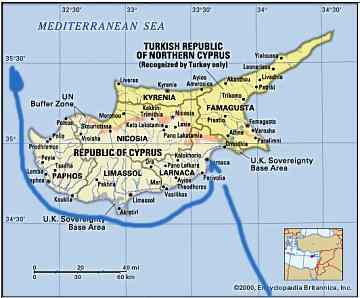 Turkish Republic of Northern Cyprus - The northern part is under the control of Turkey who invaded in 1974 in response to an assassination attempt on then-president Makarios. No other country recognizes its right to exist but the island continues to have an uneasy peace, enforced by UN troops. A recent example of such problems was the 2004 referendum on reunification as a prelude to joining the EU. When it became apparent that both parts were going to vote FOR reunification, the 80-year old leader of the Republic of Cyrus and Greece began campaigning AGAINST reunification using scare tactics, and in the end only the southern part was admitted to the EU. Thus the north remains isolated and poorer with many unresolved land claims left over from 1974. For more on our trip through Cyprus see our June 2003 Journal or move on to Turkey, our next destination which turned into a 2-year stay.